The dictionary describes Curiosity as “a strong desire to know or learn something.” Fear is described as “an unpleasant emotion caused by the belief that someone or something is dangerous, likely to cause pain, or a threat.” I would like to present the idea that a highly functioning individual will have a tendency to tackle fears with curiosity, leading them to learn about the subject until it no longer causes unpleasant emotion. Fear and Curiosity may well be linked in a beautiful cause and effect. While fear is an emotion most would rather avoid, curiosity is one of the most enjoyable emotions to be experienced. While I was with Myrnah today the wind was whipping wildly, trees violently throwing themselves in every direction, leaves and branches swirling, crashing, and falling gracelessly to the ground. 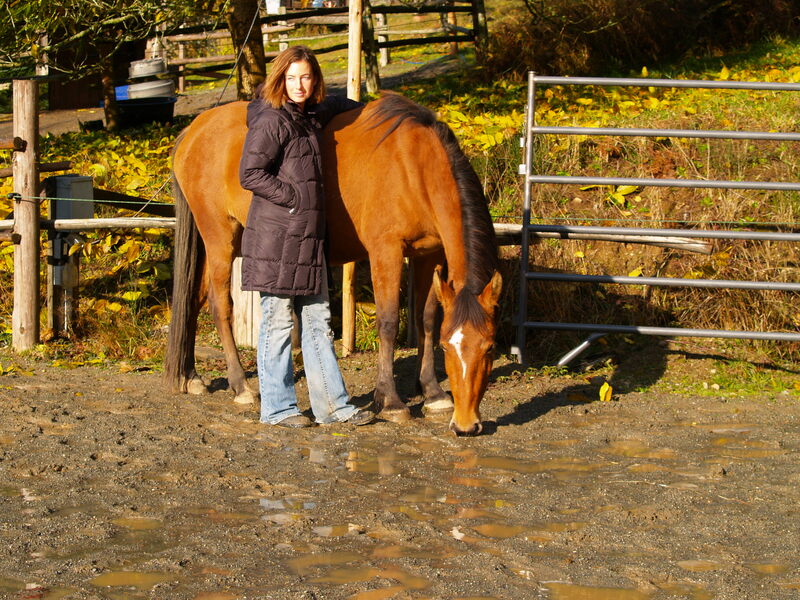 I felt like a mad woman to be out working with my horses regardless of the weather, yet there we were. We took our work out into the front yard today. 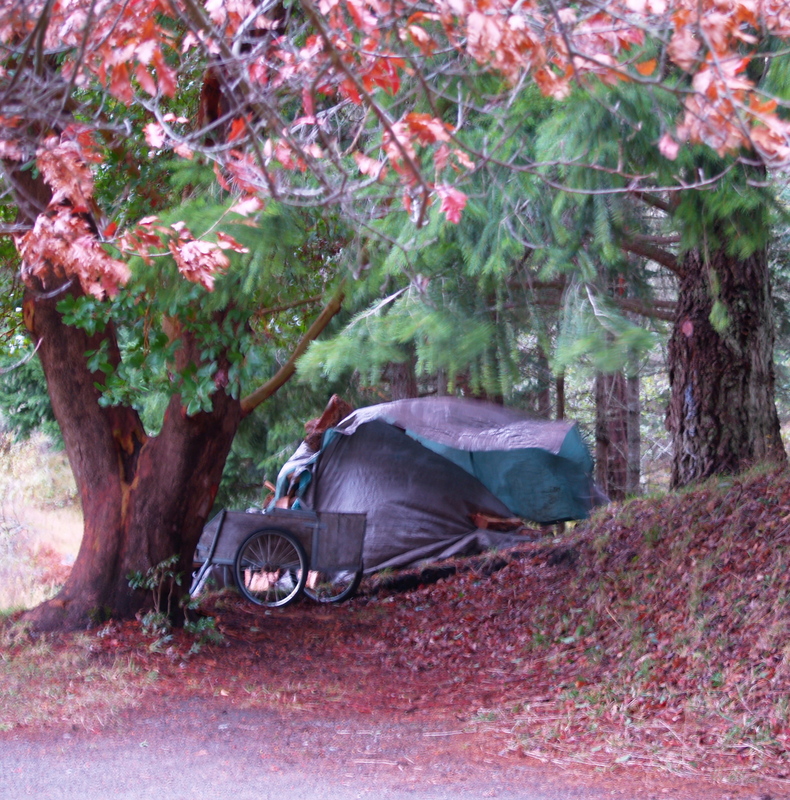 The tarp on the large stack of firewood was flapping on one side, the cat chose to accompany us hither and yon, and the noise of stormy weather was often disconcerting. I was impressed that Myrnah chose to come out the gate with me none the less. I put my hand on her withers and told her to lead the way, take me wherever she would like to go. Today was about exploring. Today was about confidence, curiosity and bravery. Through the narrow gap between the porch and the house where Myrnah tends to scoot past at the trot, every few steps I would ask her to back a step and wait. Giving her thinking brain a chance to work and her flight instincts a chance to settle. Then on we would go. Success! For the first time we made it all the way past the car with no panic and flight from claustrophobia. Causing her to back up a step gave her a moment to look left and right, to be curious about the tight space, the car and the porch, instead of simply running from it. In that situation Myrnah’s fear is high and curiosity is a weak fledgling emotion, so I didn’t ask her to stand any longer than she chose to. The back-up merely reminded her that curiosity was an option. When she chose to look hard at her surroundings, ears pricked and neck arched, I was still and quiet, breathing deep and relaxed as I allowed and supported her desire to understand the tight space. We stood still together until she was ready to move again, then we would repeat it all a few steps later. Working with a young horse in particular, the world is new, experiences are all fresh, and fear and curiosity hang in a balance. 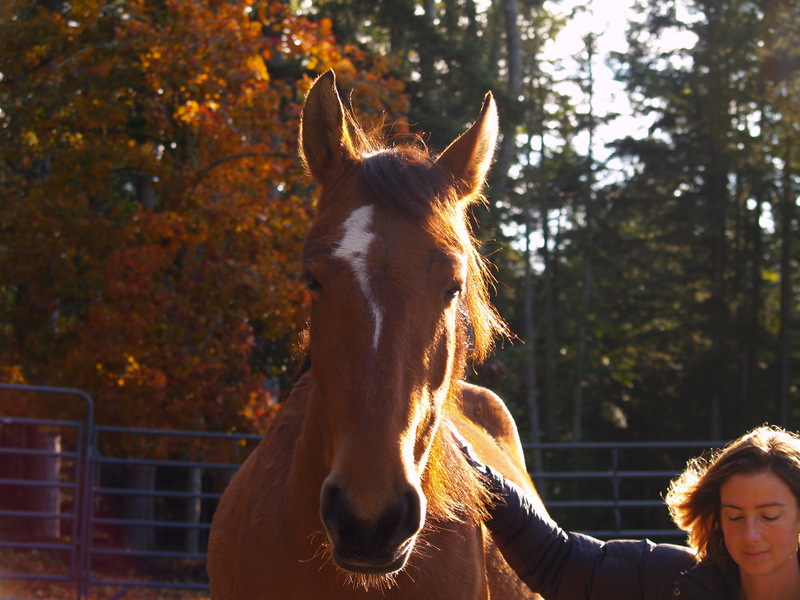 While Myrnah seems like an old soul at times, and appears more mature than domestic horses her age, I want to remember, she is only three-years old. The time I invest now, fostering and developing her curiosity while allowing the reflexive patterns of fear to weaken and fade away is worth the investment a hundred times over. So when she chooses to take me out on a walk, around the front yard, and into the woods we have never traveled through before, between the car and porch, between the bin full of hoses and shed full of hay racks, past the flapping tarp, while leaving her companion Cleo behind and out of sight on the other side of the house- just Myrnah and I exploring the world together. When this exploration causes Myrnah to stop short, ears pricked, body tight, eyes hard and focused, I stop with her and just breathe. That is the moment when curiosity and fear are in a battle: fear says it is too dangerous to go on, curiosity wants to pay attention and focus in to understand the world. If I rush the moment, pushing Myrnah on, she may be brave and lean on my confidence, but I rob her of the moment to build her own curiosity and self-confidence. If I wait, Myrnah’s curiosity will bloom, and each time it does her self-confidence in the world around her will become a little stronger. 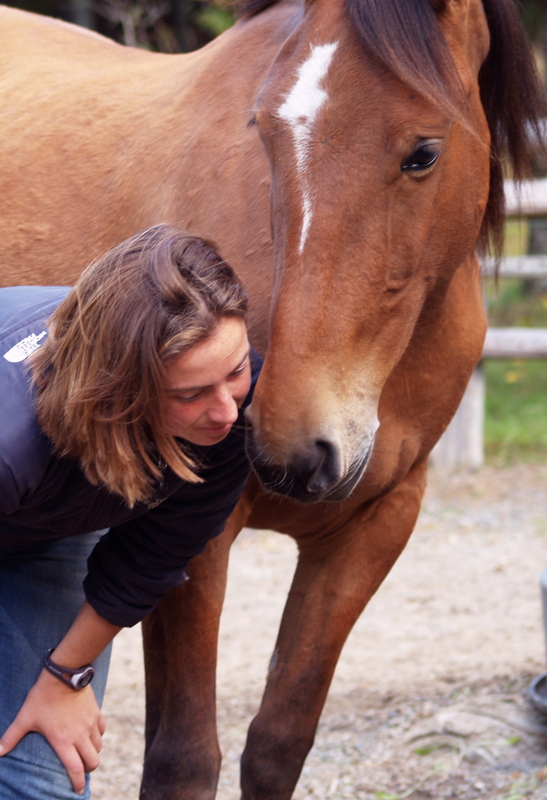 Yes, sometimes I want to be impatient and just get a horse going, and sometimes it is a useful skill for the horse to lean on their rider’s confidence instead of needing their own in a particular moment. Right now, in this project, with Myrnah so young and so much life ahead of her, I prefer to invest the time- no rush. On a day like today, every time a tarp flaps, or the cat runs by, or a branch crashes to the ground in the woods, I choose to use those moments to be still as I watch fear develop into curiosity for Myrnah. The key is the willingness to be still and pay attention. Curiosity will bloom if you give it the time and the focus. All of Myrnah’s basic skills with me continue to progress, going forward and backward, yielding the forehand, and even yielding the hind-end. All those basic skills can often help build curiosity. Fear leads to flight, so when I feel Myrnah pulling away from something- to flee from what she doesn’t understand- I can suggest a turn, or a back up to give her a moment to realize she has a choice. She can choose to learn, or she can choose to run. Both are valid; learning is just more fun than fear. If I can help Myrnah know she has a choice and build her habits of curiosity instead of fear, I feel I have done well. Everything we do together is only better on a basis of self-confidence. To wind and wild weather, to fear and curiosity, and to the quiet moments that allow us to become the best of ourselves. 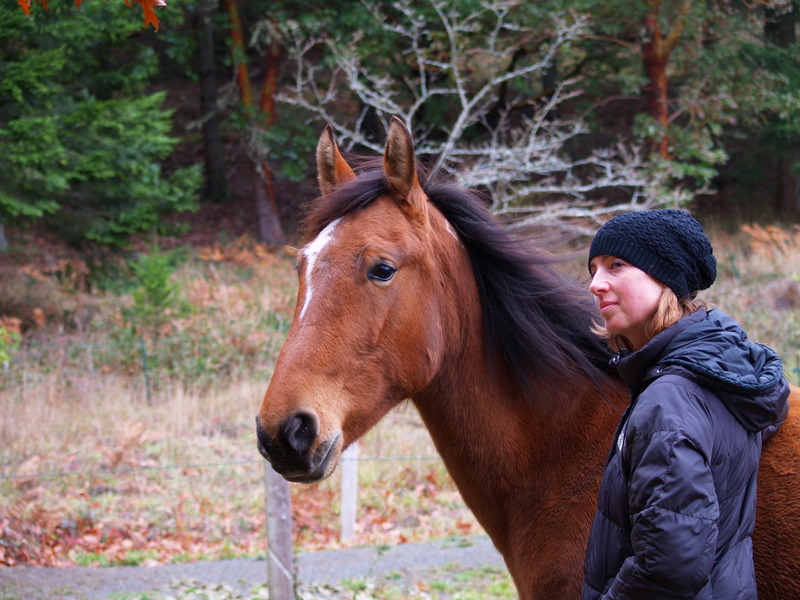 My recognized job title might be that of “Horse Trainer”; my business cards read “Equine Development Specialist”. Are they different or one in the same? The last week has me thinking…. training versus development, what’s the difference? Here is what I think. Training is building a set of habits or skills in a time frame. Development is setting up the environment to allow growth at ones own rate and speed. Training conforms the trainee to what we think they should be. Development allows them the freedom to be whatever they are fostering and encouraging the best they can be. Training follows a predictable path of cause and effect creating results; development is an organic evolutionary process where the positive results are often dramatic and surprising. What I do is somewhere in the middle. I feel that the grey area between training and development gives me the best of both worlds. Wherever safety might be an issue, I tend toward the predictability of training. 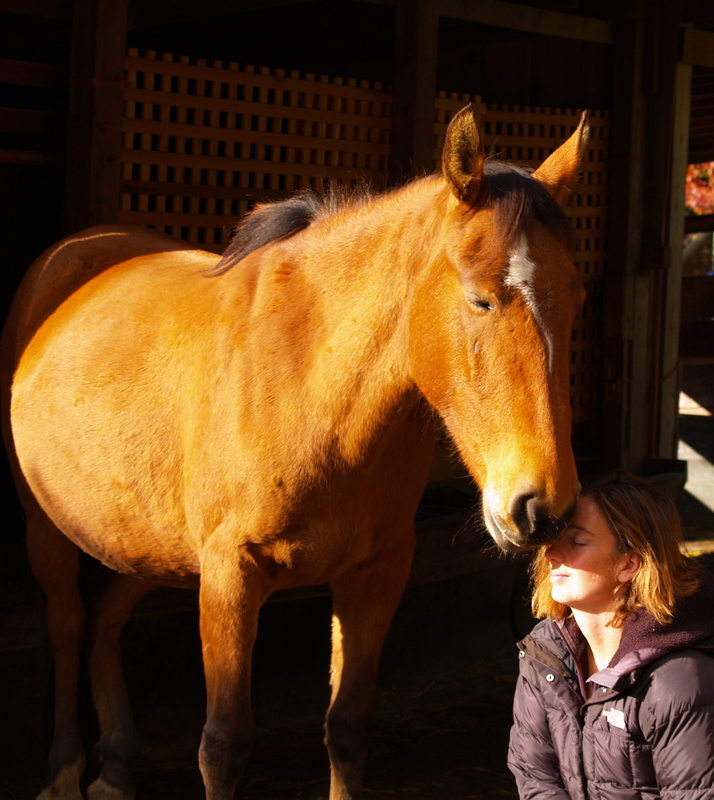 Where I want that inexplicably beautiful connection and bond with my horse, I lean toward a developmental process. With Myrnah, in this project with no tools, I have an opportunity to lean a little farther into development instead of training. Without her full participation in the process I am lost. She has to want to do everything I want to do, because I don’t have any tools to push her into doing things she would rather not. Last week I fell more into a training routine when I pushed harder than usual to try to get the hind end yield. When I realized I felt I had missed a step in our process, I then felt we SHOULD have been able to do it by now. Without the training tools on hand to help me threaten her into submission, Myrnah kicked at me under that kind of pressure. Then when safety felt at stake, I maxed out the tools I did have to re-engaged her: running around clapping my hands, yelling…. and then getting quiet when she came to me with her ears forward again. Simple cause and effect: pressure to make the unwanted action unpleasant, release to make the wanted action pleasant. Training has a time frame in mind and an idea of what the horse should know by now (such as not to kick at me or threaten my safety). 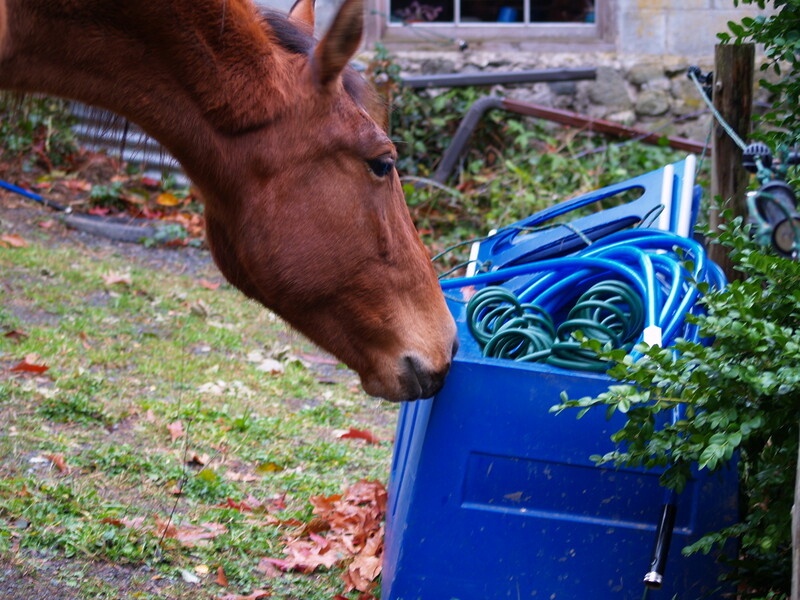 The advantage of that method is the predictable results to pressure and release, and the horse seeming to know “wrong from right.” The disadvantage is the beast-of-burden, dull attitude that can occur in any of us when we feel like we should be different than we are. All of us want to be unconditionally loved and appreciated and we cannot really be the best of ourselves when we are told we are not good enough constantly. 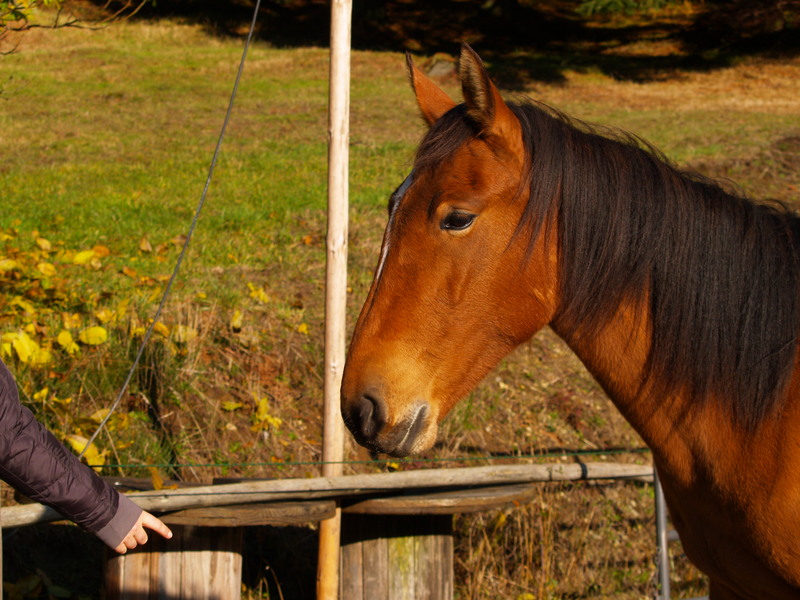 Horses are no different from people in that respect. So what might last Wednesday have looked like if I had taken the developmental approach? First off, when Myrnah started pinning her ears at me in the specificity exercise, I would have slowed way down, spent more time in advance and retreat, spent more time being playful and affirmative, and been less attached to specificity happening any time soon. Secondly, once I realized the step I had missed, the hind end yield, I would have spent more time quiet and still with my hand on her side, waiting for her to choose her response to my presence, giving her all the time in the world to decide she wanted to yield and work with me, making sure I released my focus and appreciated her the moment our connection and cooperation got stronger. Thirdly, if she had kicked at me, and I was in a developmental frame of mind, I wouldn’t have let fear dictate my response. Fear caused me to be desperate about getting our cooperative connection back in a hurry. If I hadn’t been afraid of getting hurt or losing out connection, I would have just stepped out of the way and backed off, playing with the gentle intensity of drive and draw just like we did in the beginning of our relationship to bring our connection back and start over. It’s all about time really. There is a brilliance in each of us that blooms with focus, attention, love, devotion and plenty of time. Under the pressure of a limited time frame, we can get a lot done and feel good about our competence, but the question remains: Is the immediate competency worth the brilliance we sacrifice in the process? I gave myself a year to train Myrnah without tools. A dear friend said she wished I wouldn’t put a time limit on this process, and I think I now understand her sentiments. 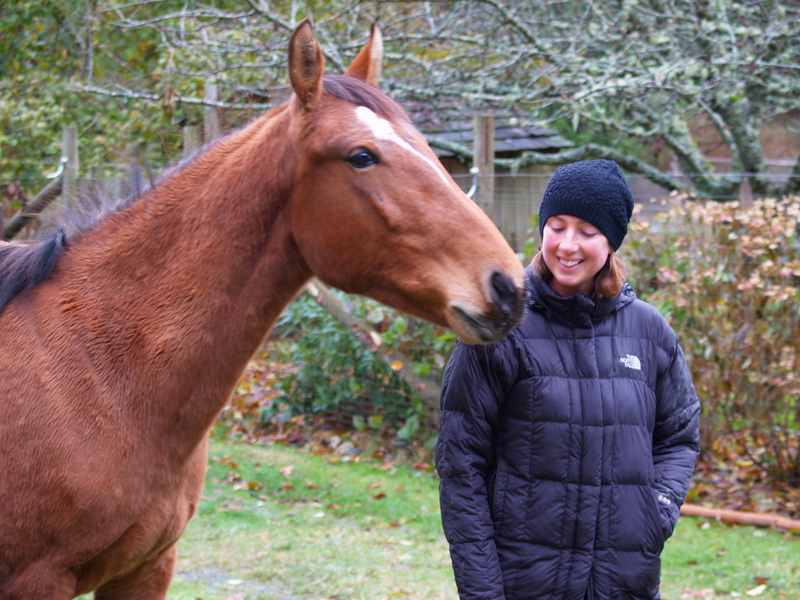 None the less as a horse trainer, and an equine development specialist, for my own education, I want to feel the pressure of a time limit. I want to see how close to a developmental process I can keep us in spite of a time frame. Nothing is black and white. Life is shades of grey between extremes. For me seeing the extremes helps me figure out where I would like to stand in the middle ground. Training versus development is a thought-provoking contrast. 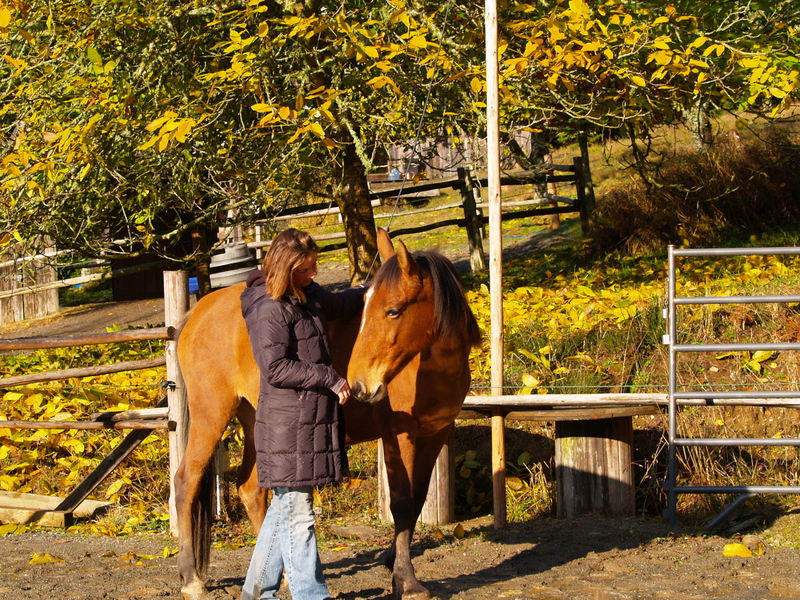 While the world might ask me to train horses on a time frame, and I would like to think I am good at it I also hope to get so good at the developmental processes that people see it, and want it and will start to value the brilliance of connection above and beyond physical competence in the moment. Myrnah is here to help me strengthen my skills of development. So here is to the unique, the surprising and the inexplicable connection between horse and rider. May I have the fortitude and patience to wait for it, nurture it, and encourage it in every way. For all who were wondering, Cleo continues to be an amazing horse. Her powers of focus and her desire to connect make working with her a brilliant experience every day. Every time her tension drops another notch and she seems a little more comfortable in her life, I feel like I have just won the lottery. Its a slightly different process than Myrnah’s but I still do my best to keep the ideas of training versus development clear in my thoughts as we progress. Thank you Cleo for continuing to be such a wonderful teacher. It seems Myrnah and I have reached a step in the process that is not as graceful as all the previous steps have been. Specificity is proving to be more difficult for us than anything we have done yet. I don’t know if I am excited by the challenge, or disappointed in myself for not setting up the course of learning better. A little of both I think. Last week was all about traveling together, developing our ease and relaxation in movement. Myrnah more or less got to choose where we traveled; I just asked her to keep moving. Everything Myrnah and I have done together so far has had a large element of choice on her part. 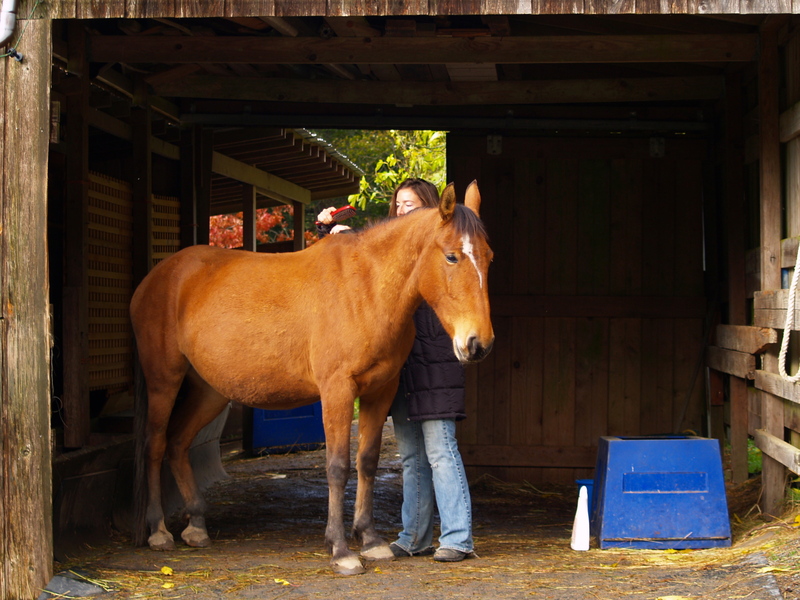 If I wanted to trim her hooves, I let her decide where she wanted to stand to have them done; and, if she changed her mind, I picked up my trimming tools, followed her to the new spot, and started again. If I asked her to turn, I wasn’t too particular about where we were headed so long as she yielded the direction asked. If I asked her to back up and she turned around in the process, that was fine too, so long as she stepped back for me. We were building a basis of communication, and I wanted all the pieces to feel easy. Little by little she became more accurate in her responses and I was thrilled. This week I set up a pattern to build specificity. 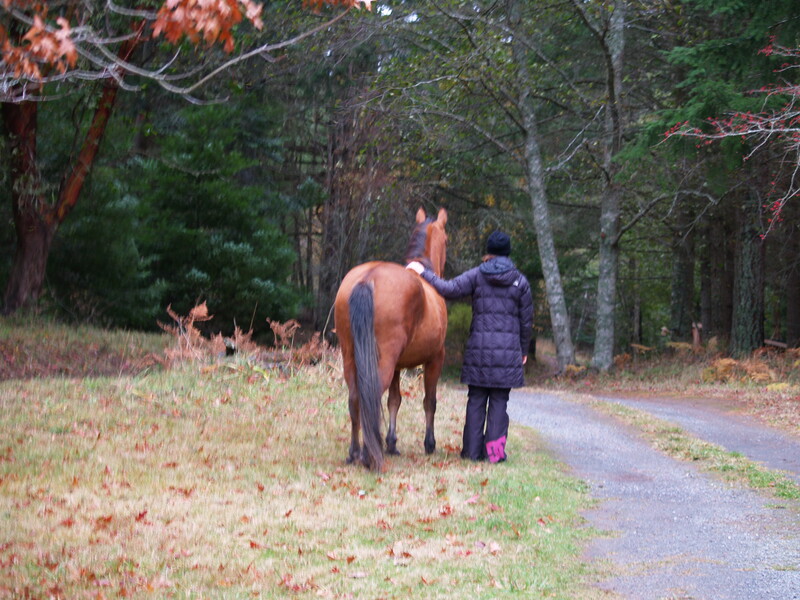 Walking together, rest in movement, the gate open between the woods and the arena, Myrnah could take me wherever she liked. New addition to the game: I added a couple of tires, double-stacked in the arena. If Myrnah was interested in investigating them, we could stop and rest there; everywhere else we needed to keep moving. 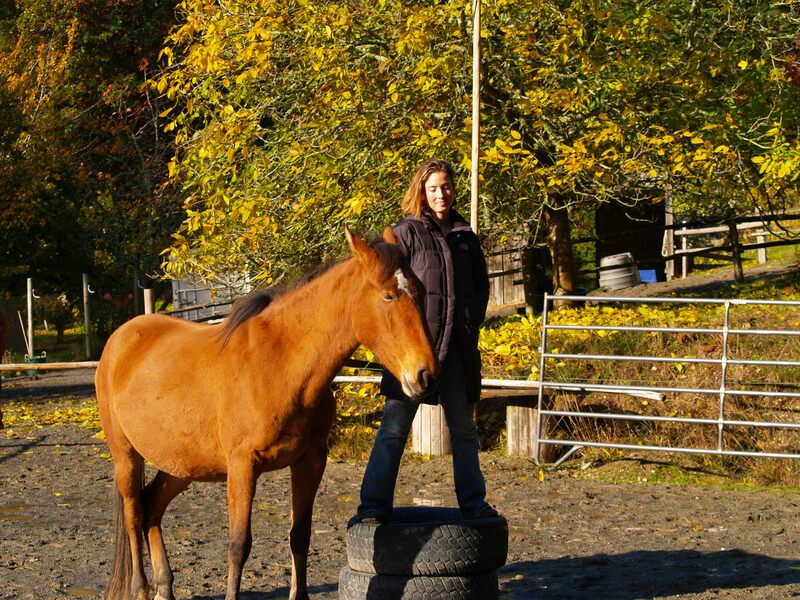 The idea is to teach Myrnah to sidle up to something (like a stack of tires) to let me get on. The first step in that is to get her to be interested in something tall that I can stand on. It worked like a charm and pretty soon those tires were like a magnet- the only place she wanted to be. From the first step of investigating the tires to get a rest from perpetual movement, we built to my standing on the tires while we both took a break. 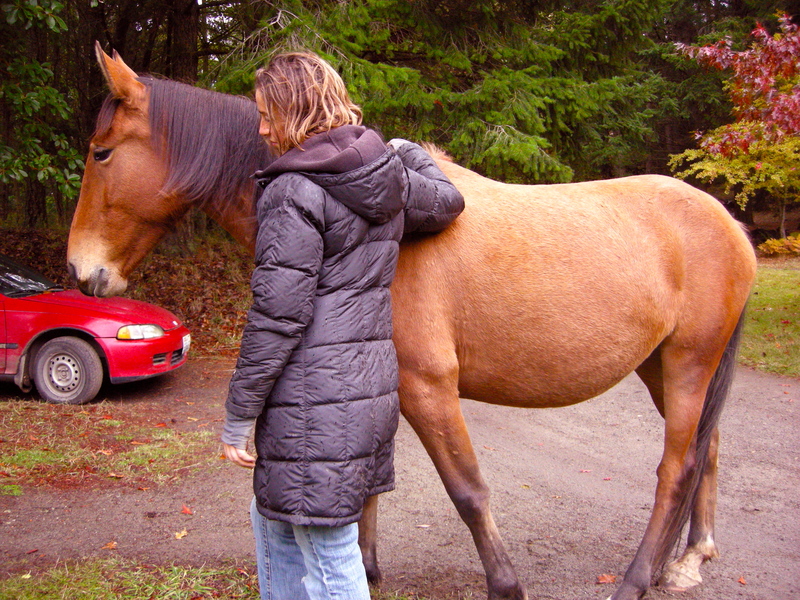 Then on Wednesday I started getting specific; Myrnah needed to put her side to the tires before we could both relax. As soon as she was in position, I would sit down and take some time to just be still with her. Getting Myrnah in exactly the right spot beside the tires was challenging for her. Anything so specific is new to us, and she didn’t want to do it. While I was happy to give it up and go walking instead, she didn’t want to do that either. 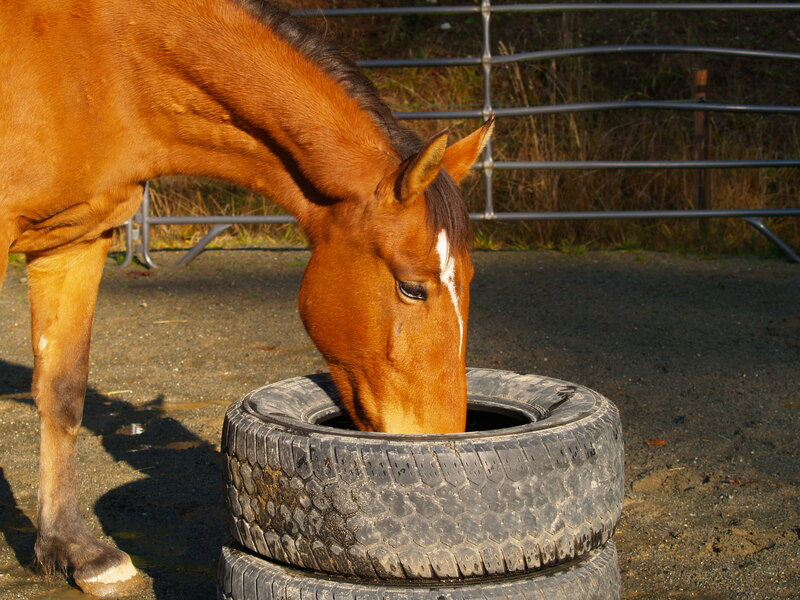 She wanted to just rest at the tires in any position she chose, and so Myrnah started pinning her ears at me. This is where I think there is a balance to be struck. “Confidence-in-one’s-self” and “confidence-in-others” need to be in balance. Myrnah has a great deal of natural self-confidence. When her confidence in me is lacking, it is easy for her to start being angry. Wednesday she had a perfectly good idea of what we should do together: (standing relaxed at the stacked tires) My idea of alternating walking and standing at a specific spot next to the tires seemed like a terrible idea to her. Too much confidence in herself and not enough in me lead to some angry gestures. 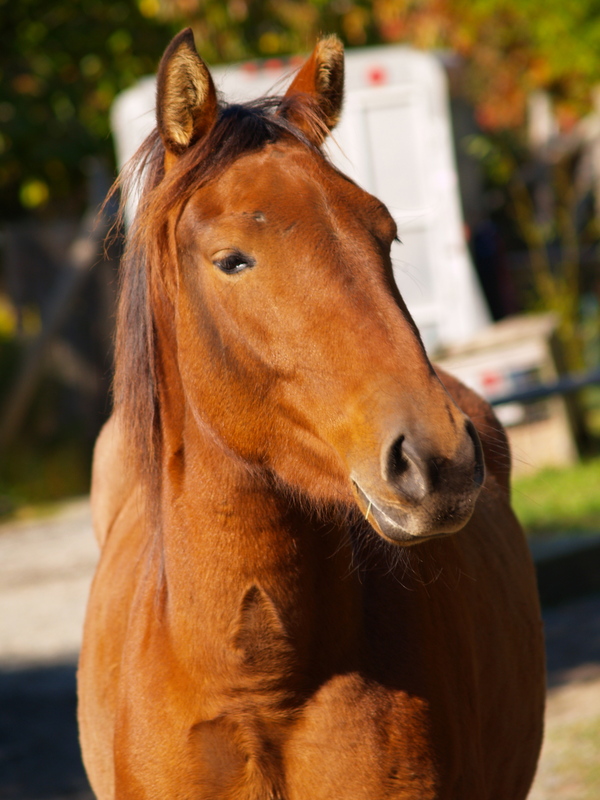 I am generally intolerant of anger, so I jumped right on it, and thought, what do I do with my other horses to build their confidence in leadership? I work on our yields: front-end, back-end, and sideways. Myrnah’s front-end yields are soft and easy; her back-end yields are relatively undeveloped. Back-end yields are something I kept putting off until our bond felt stronger. Well obviously here was a gap in her education and a missed step in the process. What happened when I went to push her hind end away from me Wednesday? She told me NO. I pushed harder and she showed me she had feet to kick me with… hmmm, pushing harder obviously wasn’t going to get me anywhere I wanted to go. (and yes I was thinking all this would be so much easier if I had rope right now and could just make her do it). So take a deep breath and break it down. We take a walk and then I play with gently putting my hand at the back of her belly to suggest she just look toward me with her nose. If her nose tips toward me, her hip will at least energetically yield, even if it isn’t physically apparent. The problem is she won’t even do that. On this day a hand on the side of her belly puts Myrnah into a strong opposition reflex, sending me running out of the kick zone. So I yell and jump up and down and clap my hands and run in circles driving her nose away from me until she looks at me with curiosity, and comes back with her ears forward. Then I sit on the ground, breathing hard, and wishing I hadn’t put off this step in the training. Breath caught, we try it again. 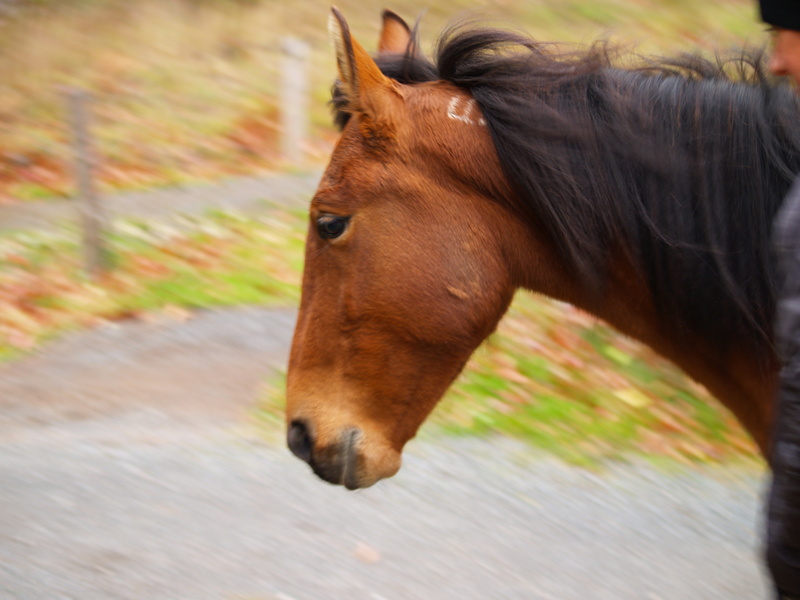 A horse’s confidence in others is based on their respect and their respect is based on their willingness to yield physical space. Willingness equals a positive attitude. When Myrnah started showing aggression, I knew her confidences were getting out of balance and we needed to build a little more respect and confidence in me, her person, and hopefully her leader. 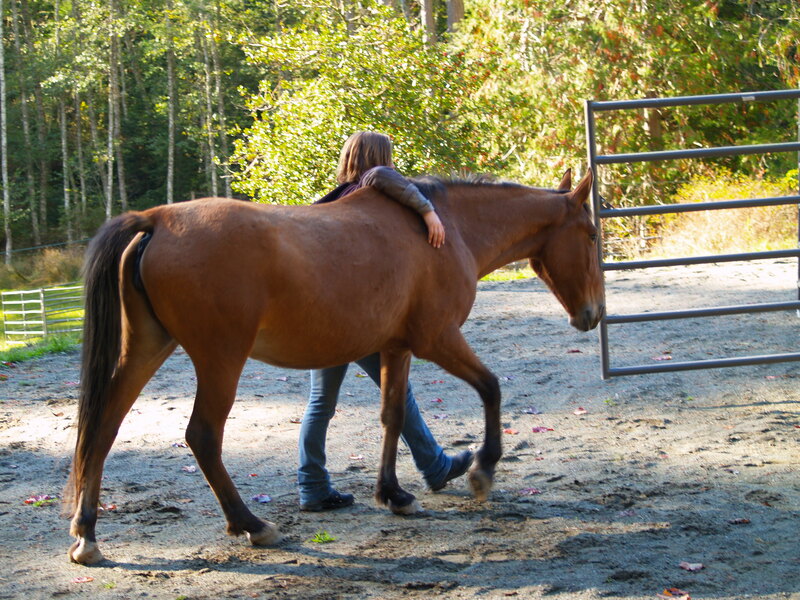 I wish I had spent more time teaching her to yield her hind end earlier in the game. Without rope or stick I wasn’t sure I could, but now I see it is a critical piece that is fundamental to later progress. On the up side, Myrnah’s extreme opposition prompted my own desperate measures, which caused her to look at me in a new and curious frame of mind. Her ear pinning seems to be melting away, her specificity of standing exactly at the mounting block has improved dramatically, and her offers of focus, arc and softness in her body while we walk together are so beautiful they make me want to cry. So thank you to the exercise of specificity for showing me our missed step in the process. I love everything I am learning through this, even if I don’t always get it right the first time. It sounds like a contradiction, rest in movement, yet I think it is contradictions like this that make us feel alive. Last week I talked about draw and drive, using those concepts to build a connection between partners. I believe it is the combination of two contrary ideas that is often a powerful force of creation. Draw and drive bond horse and rider to each other in a way that feels magical, yet, when looked at closely, we find it can in fact be understood and built logically one step at a time. Rest in movement is another one of those apparent contradictions that seem to bring power and grace into life. As of this week Myrnah is not sure she agrees, though I do jest a little here. In reality Myrnah continues to amaze me with how gracefully she moves forward to the next step in our process, time and time again. 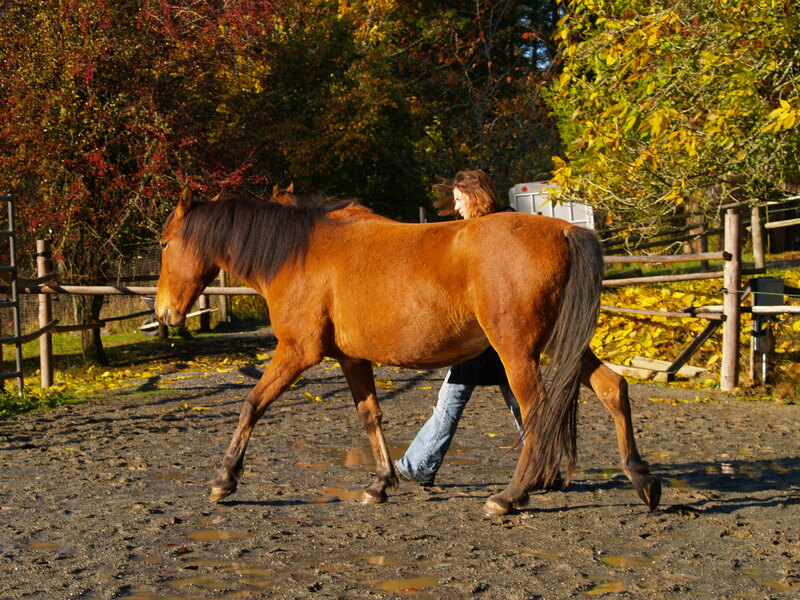 In training horses we work with the idea of pressure and release to cause growth and development. 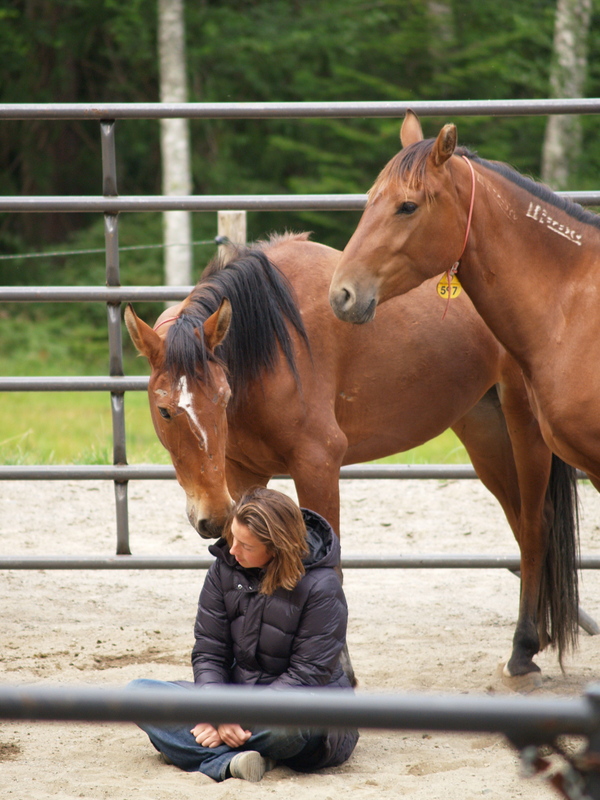 When Myrnah and Cleo were first with me, in order for them to feel release, I needed to turn my body away, take my eyes off of them, and maybe even sit down on the ground and be very still- all pressure released in an obvious way. To add pressure all I needed to do was stare directly at them; that seemed to be all it took for them to feel the need to respond. As time went on and they became more confident, I was able to release pressure simply by becoming still and quiet with them, wherever I was already standing. Putting pressure on sometimes required my walking over and causing them to take a step in some direction they wouldn’t have chosen on their own, in order for them to think about me. Up until this week I have felt I needed to follow Myrnah’s lead letting her dictate how much of any one task she felt ready to do. I wanted her to feel that working with me was easy, with releases of pressure simple to ask for. All she needed to do was reach over and touch me with her nose to ask for a break and it was readily given. Slowly, over time, I was able to ask her to keep moving through a task, past her request for a break, helping her build a stronger work ethic. If I pushed too far I could see her get frustrated; she would start to bite at me and pin her ears, letting me know she needed more release. This week we had a breakthrough. We went out in the woods for a walk and I had the thought that Myrnah was ready for more. So, instead of letting her just wander from one bite of fern to another, I asked her to keep walking. Every time she tried to stop I asked her to move- anywhere she wanted to go, just continual movement. Interestingly, she didn’t seem to get frustrated, or ask me quit the game by reaching around to touch me; she just kept trying to stop where she wanted, and then patiently walked on when I asked. Occasionally she would take me back to the paddock gate, and I would gently push her away; she would circle round to face it again, and I would gently push her away again. Sometime it would take eight, nine, ten circles before she would take me out into the woods again. We walked for 20 minutes that day, and by the end Myrnah was starting to develop a rhythm and an easy swing to her walk. As long as she kept moving, I was quiet and peaceful, simply walking alongside her, my hand on her withers and my feet in time with hers- no pressure, just the two of us resting in movement. The next day we took the rest in movement idea out the other side of the paddock into the front yard where there is lots of grass to eat. That indeed proved much more challenging. It is hard to keep moving when there is a buffet underfoot calling Myrnah’s name with every stride. I again was thoroughly impressed that she didn’t get frustrated with me; she simply pitted her perseverance against mine and gently and slowly came around to my way of thinking. 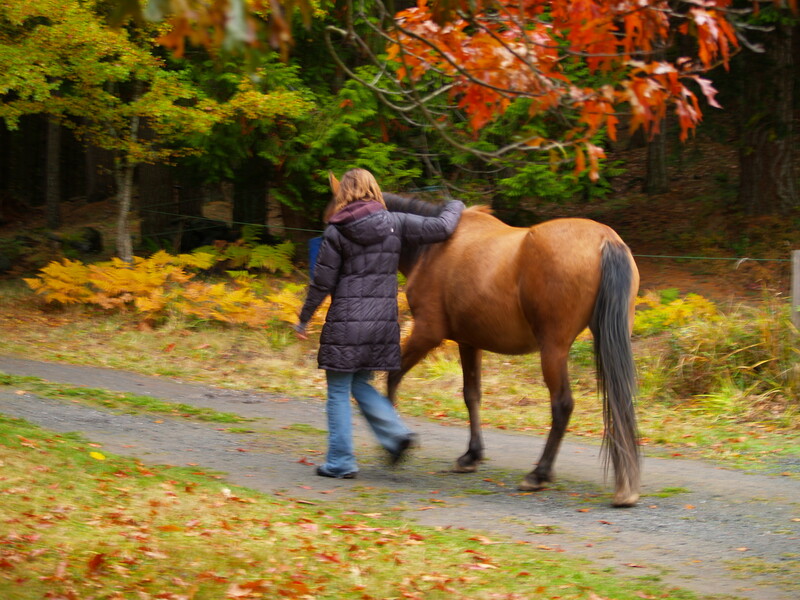 When Myrnah finally was brave enough to walk us through the narrow path between the garden and the car, taking us to a new area above the pond, I chose that moment to stop, take the pressure off, and let her graze for awhile. Rest in movement is a new skill for us; rest while grazing is an established release and reward. 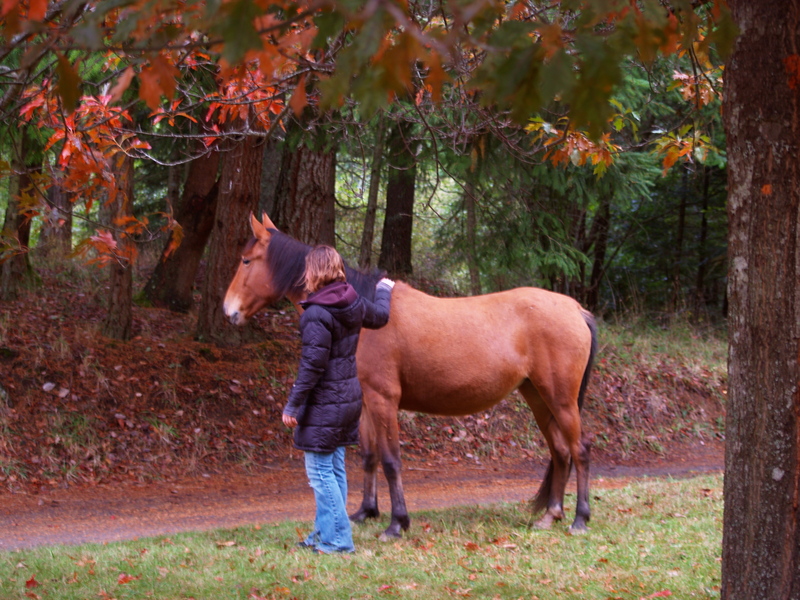 When a horse offers me a supreme effort of bravery or focus, I do my best to let them know I fully appreciate it. The interesting side effect to this rest in movement practice is the affection I get afterward, as both Myrnah and Cleo surprise me with the dramatic increase of nuzzling and focused appreciative contact. I don’t know whether they are thanking me for the simple relaxation that movement brings, or the dominant role I take on by moving them that allows them feel safe and part of my herd, or something else all together. Whatever the reason, rest in movement seems to have fallen into place perfectly as the next obvious step, and I couldn’t be more pleased with the results.